If you have a picky child, or are not a huge fan of vegetables yourself, today’s recipe will allow you to hide your veggies among whole grains and a little bit of sweetness so that they go down easily and you don’t miss out on their nutritional benefits. While I’m proud that my two-and-a-half-year-old consumes nutritious, plant-based eats all day long, I’ve found that he’s definitely not immune to some of the typical behaviors of the picky toddler. As of the last few months, if he sees something he’s never eaten, he’s unlikely to try it. If that something is a vegetable (or at least looks like one), we’re in even worse shape. Thankfully, my boy has never met a smoothie he doesn’t like, so I’m able to hide a variety of raw vegetables in that component of his daily breakfast. (That’s right – his morning smoothie is just part of his breakfast. He has an insatiable appetite in the morning, eating less and less as the day progresses.) I’ve managed to sneak raw celery, carrots, cucumbers, beets, fresh herbs, and a variety of greens right by him for many a morning now. Until he’s willing to look at a heap of broccoli and get excited about eating it, I have to get creative. In addition to smoothies, I’ve found that my super food muffin formula lends itself just as nicely to shredded vegetables as it does fruits. Today’s rendition features zucchini, which I find a bit too earthy in flavor to compliment most smoothie combinations. Zucchini, or Italian squash (pictured below, shredded in the food processor), is a solid source of vitamin C and manganese and promotes healthy eyesight, so I definitely want Nolan to have it in his diet. CINNAMON: A popular spice that you can purchase as sticks or ground, cinnamon is high in antioxidants. NUTMEG: Nutmeg, which you can find as a seed or ground, is a great source of fiber, copper, and like zucchini, manganese. The two are often paired together in cooking. CARDAMOM: Cardamom, available as pods or ground, is also a rich source of fiber and manganese and boasts a notable serving of iron, too. CLOVES: Use cloves sparingly as their flavor is the strongest of this group of particularly flavorful spices. You can find the cloves whole or ground, and like cinnamon, expect a healthy dose of antioxidants. When talking recently with a fellow mom, she shared with me that her pediatrician said that if her toddler ate one balanced, nutritious meal per day, that that was success. Obviously, we aim to feed our kids of all ages (and ourselves!) healthful foods all day long, but when it comes to the pickiest of the picky, one well-rounded meal may be the best we can hope for some days. 1 cup cooked small grains (e.g. quinoa, kaniwa, millet, etc. )–> I’m using kaniwa (see my veggie burger post). ¼ cup sweetener –> I’m using agave syrup. 1/8 cup oil –> I’m using coconut. 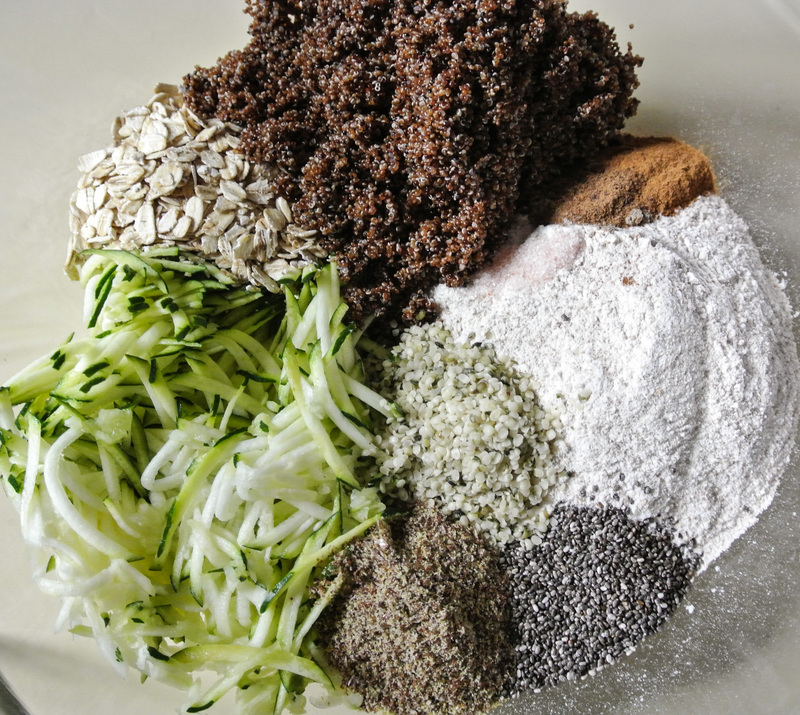 1 cup raw (fresh or frozen) fruit or veggie –> I’m using shredded zucchini*, skin on. 1-1 ¼ cups unsweetened plant milk –> I’m using almond. ½-1 tsp extract (amount will depend on flavor intensity) –> I’m using 1 tsp homemade vanilla. ½-1 tsp spices –> I’m using ½ tsp cinnamon, ¼ tsp nutmeg, and 1/8 tsp each cardamom and cloves. All spices are ground. ½ tsp pink Himalayan sea salt (optional) –> I’m using it. *Shredded carrots, parsnips, beets, or sweet potatoes would also be delicious! Preheat your oven to 350 degrees. 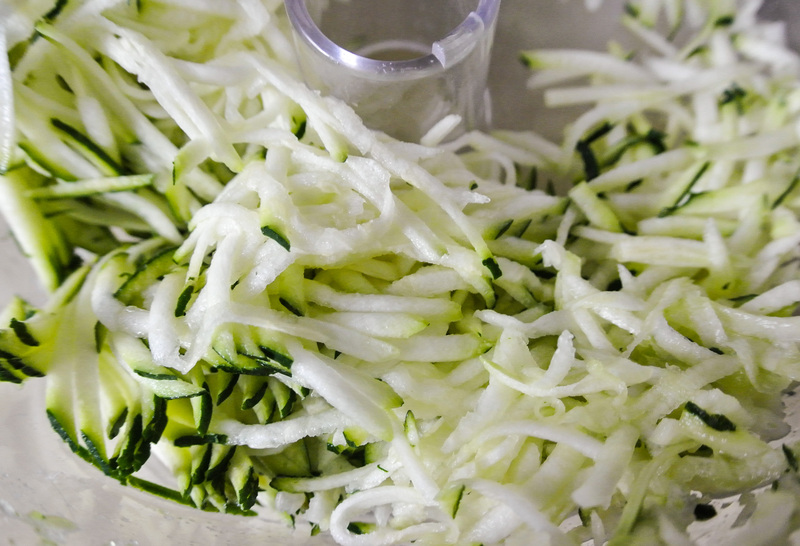 Shred your zucchini (or other vegetable) in a food processor. Separately combine all of the dry ingredients and all of the wet ingredients. Pour the wet into the dry and mix with a wooden spoon. The batter will be thick and lumpy, but you can always add more plant milk if it seems too dry or dough-like. 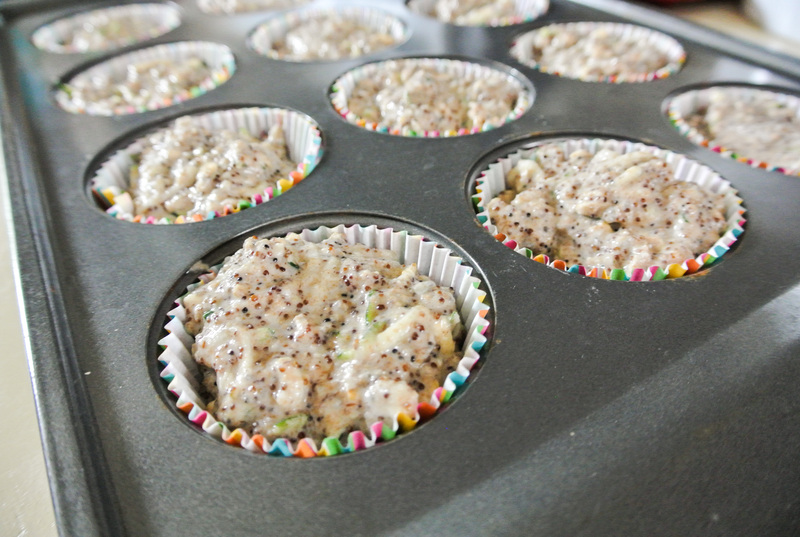 Spoon the batter into a lined cupcake pan and bake for 25 minutes. Store in the fridge for up to two weeks.